In the last issue of The Dispatch my good friend Fred Ruby of The Southern California S Gauge Club stated that everyone was waiting for the announcement of the next Flyer Fest West to be held in The San Francisco Bay Area. Well, wait no longer, here it is. 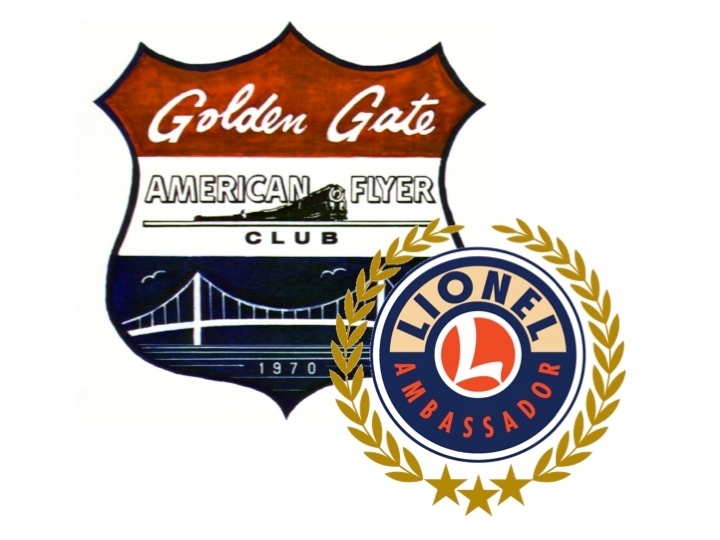 The Golden Gate American Flyer Club has quietly been planning this event for the past year. This is the first time that our club has worked with Lionel to offer, not just one, but two S gauge convention cars. These stunning cars are very limited in quantity and are offered to the first people who pay for them. The price for the two-car set is $159.99 plus $15 for shipping if you are not going to attend the Fest. Our convention begins on Friday, May 19, 2017 with a BART (Bay Area Rapid Transit) ride from the Millbrae station to Market Street in San Francisco. From there we hop a cable car over Nob Hill and down to Fisherman’s Wharf for an enjoyable lunch at the finest sea food restaurant in San Francisco, the world famous, Scoma’s, looking out at Alcatraz Island. After lunch, we visit the shops and sights of San Francisco’s fabulous Pier 39. Then back to Millbrae by Cable Car and BART. In the evening, there will be a no host cocktail/dinner welcoming party at The Poplar Restaurant in San Mateo. Saturday, May 20th is the trading and banquet day at the Poplar Event Center (same location as the restaurant). Our trading room overlooks the beautiful San Mateo Golf Course. The banquet will take place in the early evening. Registration for the Fest is $15.00. The banquet is $46 per person. This year our convention features a spectacular display of Gilbert Erector fabrications presented by our banquet speaker, Gary Jarvis of Southern California. Gary will show some of his most intricate creations, all made of Gilbert Erector parts. We will have many S gauge items in our silent auction as well as our live auction. Some really nice items will be raffled off. On Sunday, May 21st we will have layout tours. Vern Brooks has a fantastic layout that was dug out one shovel full of dirt at a time. Come see a labyrinth of S gauge trains running through a grotto underneath his home. Another layout open will be my layout which is 76 feet long and in a specially built addition to my home. You may see this layout by going to our web site. (click here) E-Bay filmed a commercial of my layout that so far has been viewed by close to 3 million people. I encourage every S gauger to attend this once in a lifetime convention in sunny California and to bring the entire family. You won’t be disappointed. Take an extra week or two and visit many of the wonderful attractions of the San Francisco Bay Area. Visit the famous wine country in the Napa Valley and ride The Wine Train, see The Golden Gate Bridge, take a side trip to John Steinbeck’s Monterey, ride The Cable Cars in San Francisco, visit Alcatraz Island or enjoy the many other activities of this beautiful part of America.